With a 5.7lt MerCruiser sterndrive it’s got plenty of pace to stay ahead of the breakers. A split windscreen affords easy access to a sumptuous boyrider. An infill transforms the area into a sunpad. The sturdy Roswell tower is a first-rate bit of gear. The helm has an undenibaly sporty character. 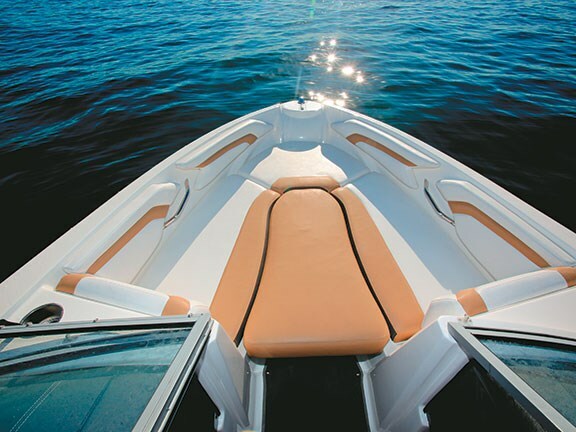 Forget the entry-level tag – this boat’s so inviting you’ll never want to leave. American bowriders are great harbour and river boats but everyone knows they can't handle the open ocean. 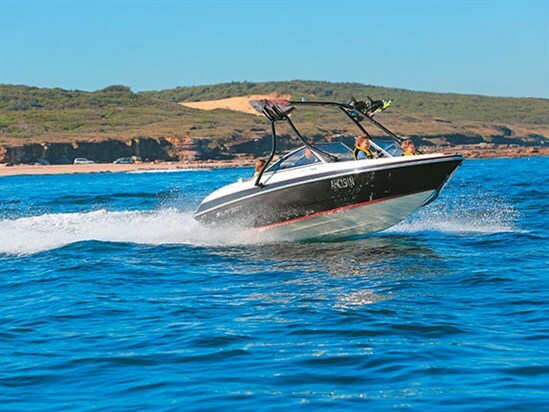 That's what I thought too, until Good Times Marine head honcho Derek Rodway suggested we test his new Larson LX 225 S by chasing whales offshore with his family and then indulging in some sightseeing, including touring some gnarly surf breaks off Sydney's Cronulla Beach. At just over 7m (or 23ft), the 225 S is an imposing presence on the water and its spacious cockpit will accommodate a large family in style. That meant there was plenty of room for our party of three adults and three kids to spread out. As with all families, we had loads of 'necessities' to bring aboard and the Larson soaked 'em up — food and drinks were sent to three cooler bins around the boat while ample storage around the seats and the enginewell took care of spare clothing and safety equipment. 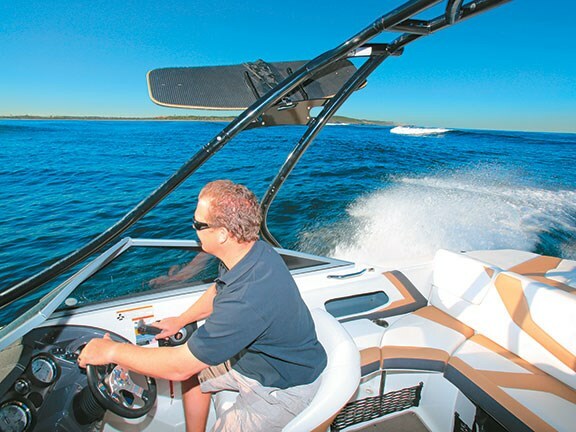 This is a great boat for socialising — the driver and passenger seats swivel backwards to face a U-shaped lounge that wraps around the rear of the cockpit. An optional dining table turns the space into a relaxing nautical picnic area or, in our case, a peaceful morning tea spent talking boats while the kids played with their iPods in the bow. Guests are welcomed at the wide two-stage swim platform and a retractable cushion on the starboard side walkway keeps the upholstery shipshape. In the cockpit I found comfortable seating for five on the lounge with two more positions at the helm and room for four or five more in the bow. The rear sunpad over the engine bay also converts to a rear-facing rumble seat for two. 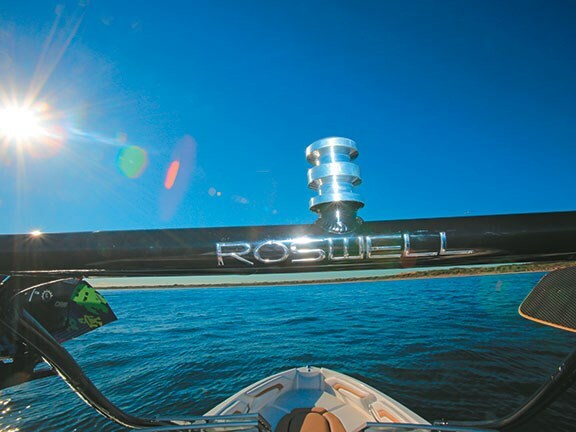 Overhead on this boat was a black Roswell Area 52 tower that adds to the boat's sporty appeal and practicality, with the clip-in racks offering storage for boards to keep them out of the way. The tower includes double tow points and it's pre-wired for a choice of external speakers to augment those already on board for the Jensen stereo. There is simple access to the bow and the wide 2.54m beam and supporting underwater chines mean the boat has good stability at rest. Seating up front is comfortable and there is lots of space to stretch out on a bow infill that turns the forward section into a relaxing sunlounge. Fibreglass-lined, insulated and drained storage areas below the seats look neat and can double as coolers for drinks and food. There's no bowsprit or dedicated anchor storage but there is space for an anchor under the seats and unobtrusive stainless steel pop-up cleats to secure it when deployed. 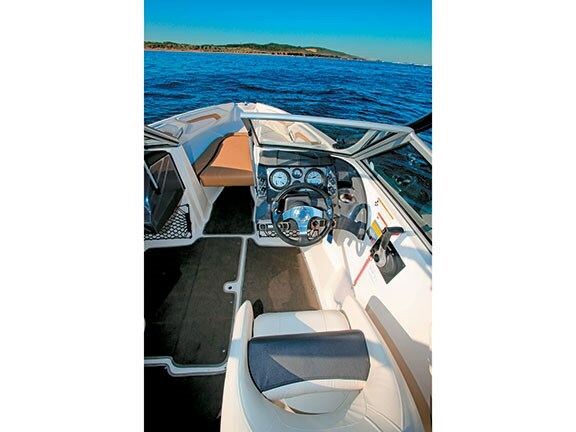 In keeping with the boat's sporty appeal, the driver's seat is a well-contoured bucket with plenty of support and has a 20cm slide adjustment, plus a flip-up bolster to cruise and be seen. A vinyl hood over the instrument display ties the panel together while the three-piece wheel has a grippy, vinyl trim and vertical adjustment. Gauges are clearly visible and provide information about important engine condition and trim. 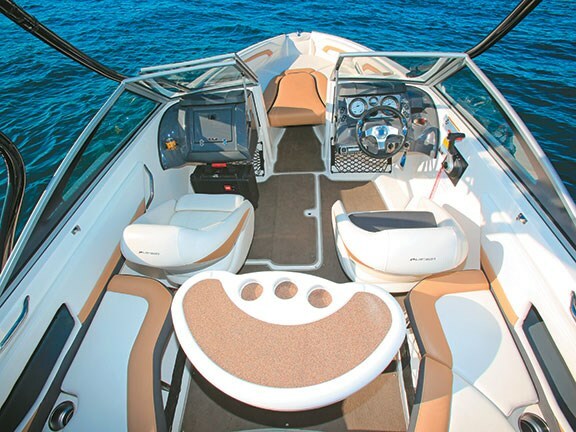 To port, the passenger gets the same stylish seat, plus a glovebox and grab handle, while in both footwells there is useful storage space, with yet more room between the helm seats in a monster underfloor ski locker. It was time to experience the bowrider for myself as a lazy 1.5m swell and 0.5m chop provided just the right conditions. Settling into the helm, I soon feel at home with well-positioned controls and the seat and wheel adjusted to suit. Visibility through the screen was good and the high sides offered reassuring security. Power is from a 300hp MerCruiser and it had us underway quickly with no undue lifting of the bow to inhibit forward vision. Running parallel to the beach we cruised at an easy 70kmh, hitting incoming swells at an angle, and I found we could maintain this speed at every approach to the waves with a gentle ride over the chop and an easy motion over the swell. No doubt the deep 21° deadrise contributes to the boat's superb seakeeping and the hull inspires confidence. Handling was equally impressive. The boat turned predictably and smoothly and even in the choppy water there was no wallowing or pitching. As an offshore cruiser, the Larson accounted for itself extremely well and I can see intrepid owners would have no problems running along the coast between ports in the right conditions. We did find the tacho was giving false readings so we were unable to record accurate speed runs through the range. However, I can report that I wound the boat out to a top speed of 86kmh and it still felt impeccably safe, offering no surprises. A 55kmh mid-range cruise was at about 4000rpm and my best guess is that planing speed (around 20kmh) would see you sitting at a bit over 2500rpm. Our test convinced me that the Larson is no one-trick pony. 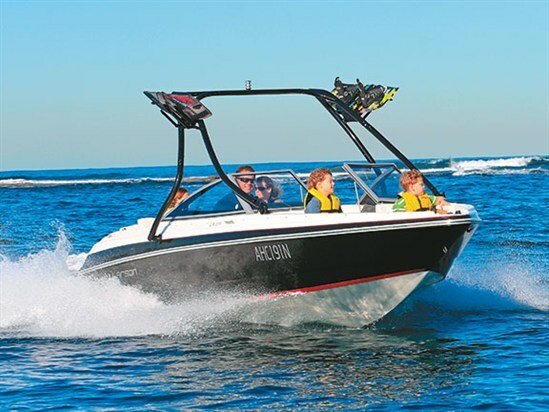 It's a roomy entertainer with power to tow water toys and the speed to thrill. It won't be out of place amongst the youthful wakeboard fraternity and it's right at home as a leisurely family cruiser on the harbour. 2.54m beam means the use of Wide Load signs. No real inconvenience. Bow infill, stainless steel package, tilt steer, dinette table rumble seat, Roswell tower, and more.